Drama/Comedy/Romance/Gainful, Italy, 1997, 116 min. Tagline An unforgettable fable that proves love, family and imagination conquer all. 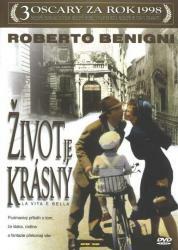 Synopsis Set in late 1930s Arezzo, Italy, Jewish man and poet, Guido Orefice (Roberto Benigni) uses cunning wit to win over an Italian schoolteacher, Dora (Nicoletta Braschi) who's set to marry another man. Charming her with "Buongiorno Principessa", getting the timing perfect every time and whisking her away on a green horse (don't ask!) ensures they soon live together happily in Guido's uncle, Eliseo Orefice's (Giustino Durano) house. Bringing up their 5 year old boy, Giosué (Giorgio Cantarini), the war continues without them noticing until one fateful day when the Germans arrest Guido and his son at the uncle's house during preparation for Giosué's birthday party, and transfer them to a concentraction camp. Dora demands to be taken too, thus Guido is devastated to see his non-Jewish wife board the train.Protecting his son from the vile truth, Guido tells Giosué that they are just on a big hoilday, and he turns the camp into a big game for Giosué, claiming that they must win 1000 points to win a real tank and leave. His elderly uncle, however, is on a different "team" and is lead towards the showers first. Guido must complete "tasks" for the camp "moderators" (ie. the Nazi SS), while avoiding the impending fate with everything he can offer. His quick thinking saves Giosué from the truth when a German officer requires a translator. Despite not speaking a word of German, Guido steps forward and makes up the "Regole del Campo" from the German's body language, claiming that tanks, scoreboards and games of Hide and Seek litter the camp, while cleverly stating that Giosué cannot cry, ask for his mother or declared he's hungry, resulting in the loss of the "game", in other words, death.Giosué later refuses to take a shower, and unknowingly escapes being gased, so Guido hides him with the help of other Italian prisoners, since there are no other children. Playing messages over the tannoy for Dora, kept prisoner on the other side of the camp, the family build up hope, only to be diminuished by the SS. With the help of Guido's former German friend, Herr Lessing, Guido can hide Giosué amongst the German children, while waiting the German Officer's meals. With the days becoming steadily worse, Guido realises that time is short and that he must make certain sacrifices if his son is ever to see the tanks roll over the hills, and be reunited with his mother. Giosué is pessimistic, and doesn't believe that there are any real tanks or games.Hiding Giosué in a junction box for the last time, telling him that everyone is looking for him, Guido jeapordises his own survival to prevent the Germans discovering Giosué, while he attempts to free Dora, giving his own life away at the same time. The Americans break into the seemingly deserted camp the following morning. Giosué immerges just as a tank pulls around the corner. Hitching a lift out, Giosué soon spots his mother and the film closes.